There are those who were born to play the game. The ball, destined to be at their feet, manipulated, caressed, mastered. Seeing them play football is like watching an artist who’s mastered his craft. Michelangelo sculpting David; Da Vinci Painting the Mona Lisa. It’s spectacular. Then, on the other hand, there’s a large collection of us who frankly seem to have no God-given footballing talent whatsoever. You’ll find a generous smattering of these guys at any 5-a-side centre on any night of the week. But it’s the people’s game, and it takes all comers. From the exceptionally talented, to the enthusiastic guy who simply makes up the numbers – they’re all welcome. And the great thing is, every now and then even the most unlikely player is capable of a bit of magic. A deft flick, a mazy dribble, a volley that fizzes right into the top corner. Every dog has his day. Of course the reverse is true too. It really doesn’t matter if you’re a talentless try-hard or an ex-pro: sooner or later, 5-a-side will bring out a mistake in you. And thankfully, with cameras now being installed in many 5-a-side venues, we can capture those mistakes in glorious video for our amusement. Tennent’s have started doing that with their T5s cameras at various venues across Scotland. 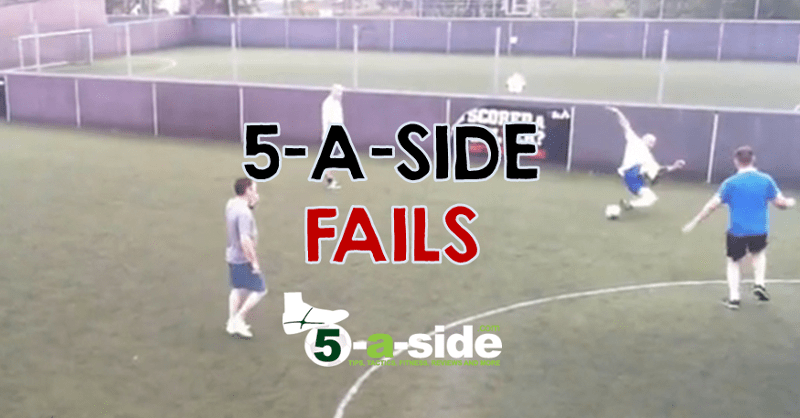 So here’s a short video celebrating some wonderful mistakes from the 5-a-side pitch. Enjoy!